Let's talk about lasagna for a minute. It's pretty amazing, right? 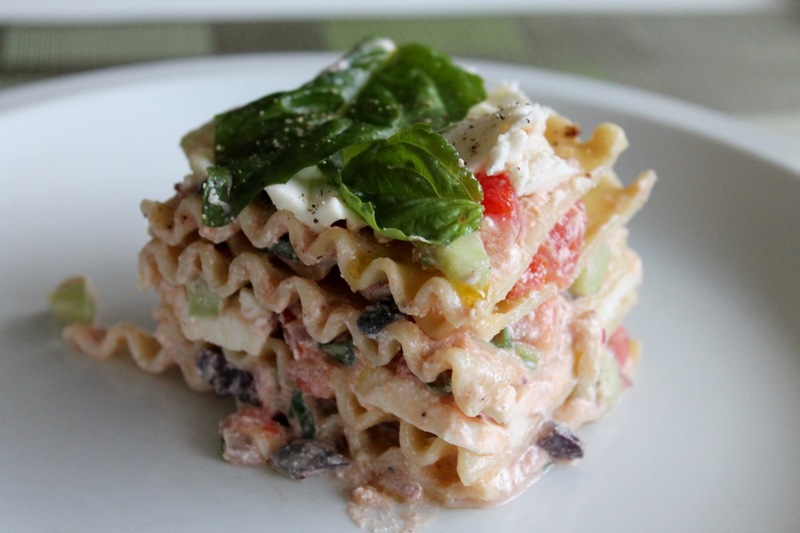 Warm layers of chewy pasta alternating with layers of tomato sauce and gooey cheese. My mouth just started watering. It's a wonderfully versatile dish that can easily be adapted to include meat (or not), other vegetables (like squash) or not. You can definitely have it your way. And it tastes good just about any time of year--except, perhaps, when the mercury rises up for those sweltering summer days like we're having right now. Do you want your kitchen oven to be on for hours this time of year? I didn't think so. It's enough to make you want to kiss lasagna goodbye (temporarily, of course). Except it's such a shame, since lasagna is loaded with ingredients that are really good right now, principally tomatoes, which are reaching their peak. It lends itself well to lighter cheeses like mozzarella and ricotta, which are also summers staples. 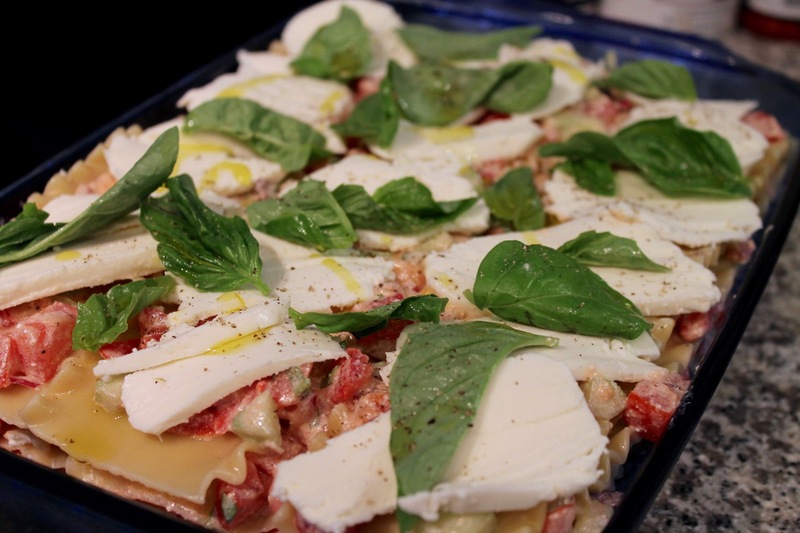 When you consider the fact that lots of other summer vegetables and herbs can play nice in a lasagna, I think it's time to find a compromise that lets us enjoy this wonderful dish even in 90-degree-plus weather. So I did something novel: I made lasagna with the oven turned off. That's right. This lasagna is not baked. The noodles are cooked, but that's it. 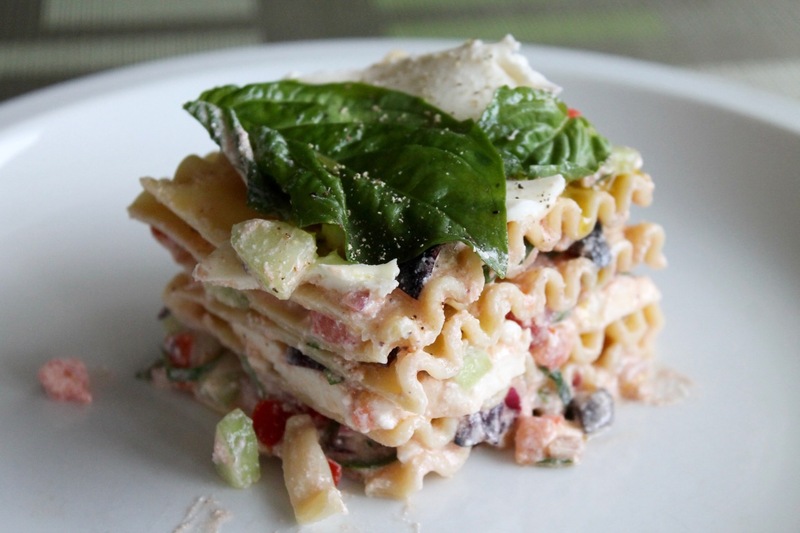 Consider it a cross between a pasta salad and a traditional lasagna. And the results were really quite good. The fresh ricotta "melts" into the fresh vegetable ingredients to make a delicious fresh uncooked sauce that's still sturdy enough to hold the layers of noodles together. I conceived this dish as my entry for this year's Washington Post tomato recipe contest; however, unfortunately, the Food section staff revealed last week that there will be no contest this year. I hope it comes back. It's one of my favorite features they do (if it does, you can be sure I'll enter this next year). Some tips: be sure to use regular lasagna noodles, not the "no boil" kind. Since you aren't baking this lasagna, the no-boil noodles will not work. You could probably use regular ricotta in place of fresh ricotta, but I haven't tried it. I find that fresh ricotta, which I get at Whole Foods, is a little firmer, so the consistency might be different, but I don't think it would be a deal-breaker. You can always make your own ricotta too. 1. Bring a large pot of salted water to boil. 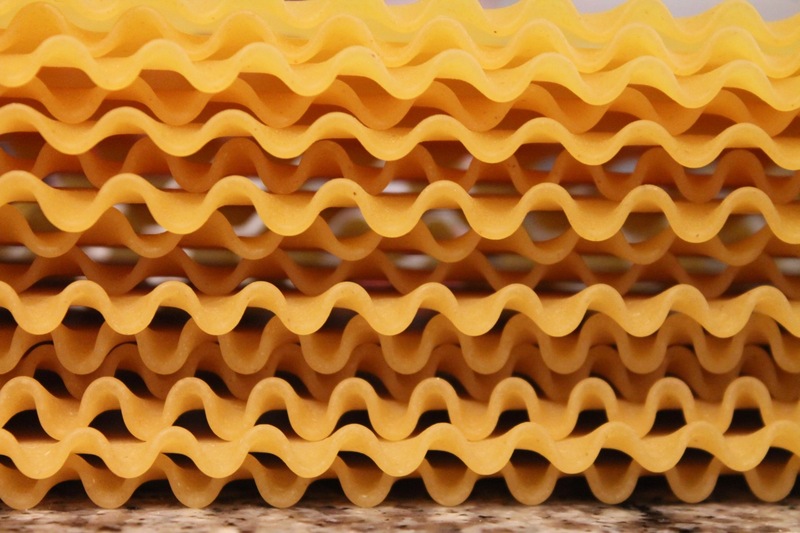 Cook the lasagna noodles according to package directions for al dente. Drain and set aside. Lay the noodles flat on an oiled baking sheet until ready to use. 2. 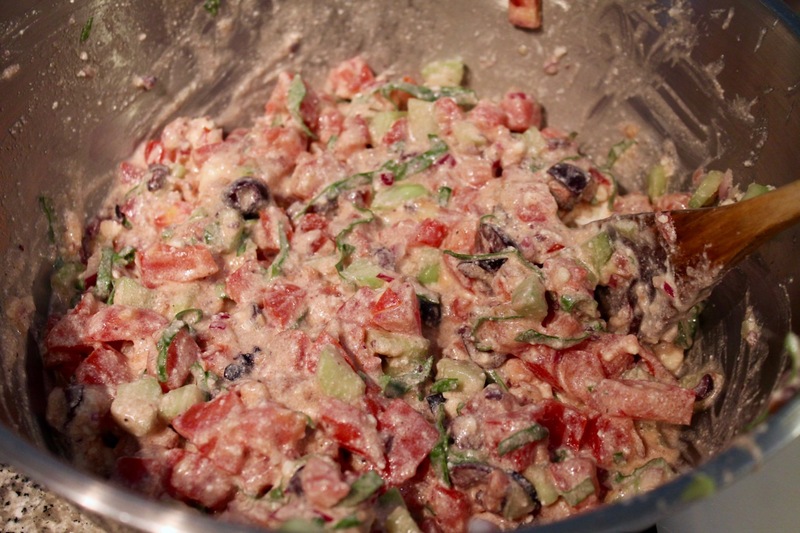 In a large bowl, combine the diced tomatoes, cucumber, red onion, olive and basil ribbons. Add the ricotta, olive oil and vinegar and stir to combine until the ricotta is well mixed and the mixture is "saucy." Season with salt and freshly ground black pepper to taste. 3. In a lightly oiled 9 X 13 baking dish, spread about 1/2 cup of the sauce on the bottom of the dish, then lay 3 noodles on top, followed by about 3/4 cup of sauce, a second layer of noodles, another 3/4 cup of sauce, half of the sliced mozzarella, a third layer of noodles, another 3/4 cup of sauce, a fourth layer of noodles, another 3/4 cup of sauce, a final fifth layer of noodles, the last 3/4 cup of sauce (portion the sauce evenly, you may use a little more or a little less than 3/4 cup each time), and the remaining half of the sliced mozzarella. Spread the whole basil leaves on top, drizzle with a little olive oil and finish with a sprinkle of freshly ground black pepper. 4. 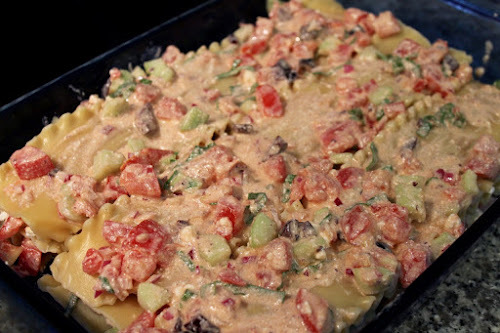 Chill the lasagna in a refrigerator for about an hour. Serve cold cut into single-serving portions. Store any leftovers in the refrigerator--this is really good the next day too.